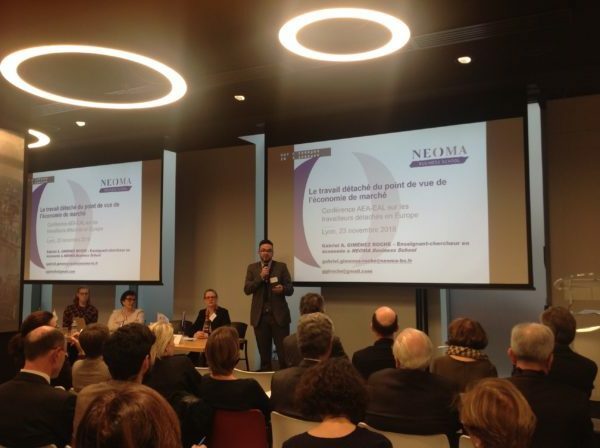 A successful conference on posted workers in Lyon. With a number of engaged participants, top speakers and lively discussions it was one of the best AEA-EAL event organized this year. Thank to Lyon Bar for hosting us in its premises. Thanks to all speakers, participants and organizers for our common success! 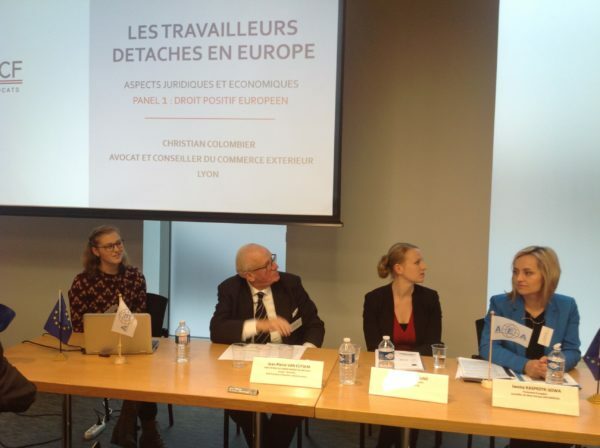 Une conférence sur les travailleurs détachés à Lyon. Avec un certain nombre de participants engagés, des orateurs de premier plan et des discussions animées, ce fut l’un des meilleurs événements AEA-EAL organisés cette année. Merci au Barreau de Lyon de nous accueillir dans ses locaux. Merci à tous les intervenants, participants et organisateurs pour notre succès commun! 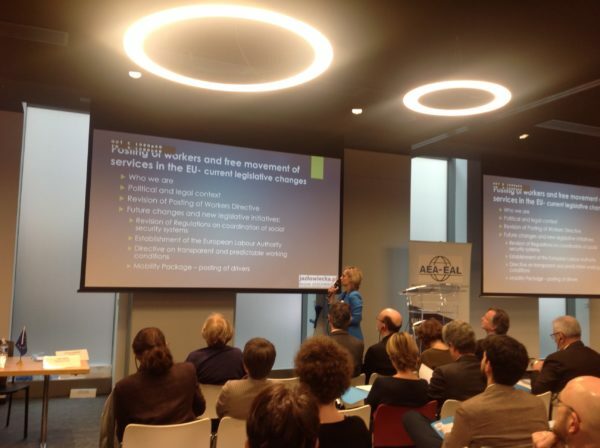 Slides from the seminar "Market Access: legal parameters in Europe and beyond"
We share with you slides from the AEA-EAL seminar “Market Access: legal parameters in Europe and beyond”. 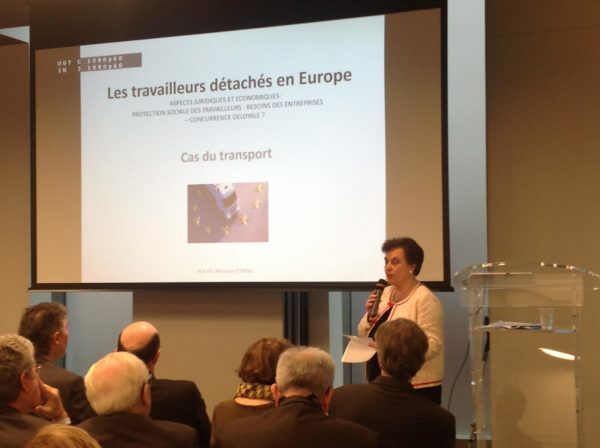 The event was organized in cooperation with the World Trade Institute as well as with the University of Bern. 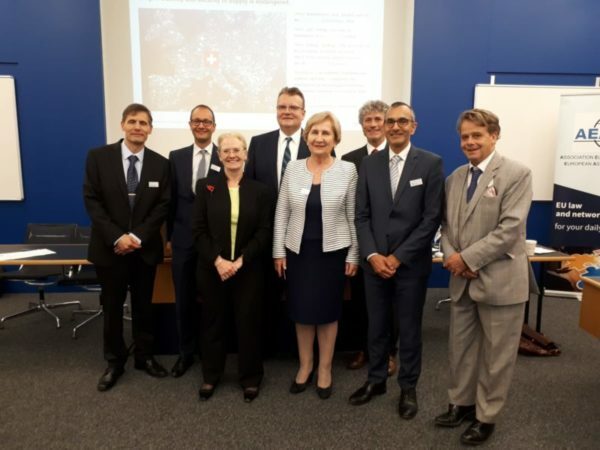 Speakers were high representatives of the Swiss and Liechtenstein governmental (and other) institutions being involved into access to the Single European Market matters as well as ambassadors of various countries, among the others UK, Ukraine and Mongolia. 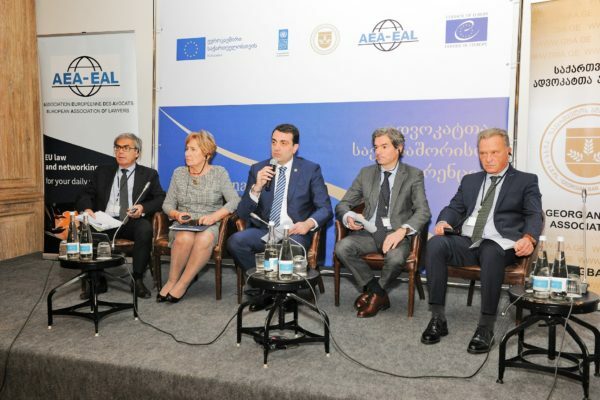 The aim of the conference was to discuss various ways of access to the EU Markets, to indicate obstacles to such access and their consequences as well as possibilities to avoid them. A very intensive first day of the conference on the Modern Legal Profession held today in Tbilisi together by the Georgian Bar Association (GBA) and European Association of Lawyers (AEA-EAL). 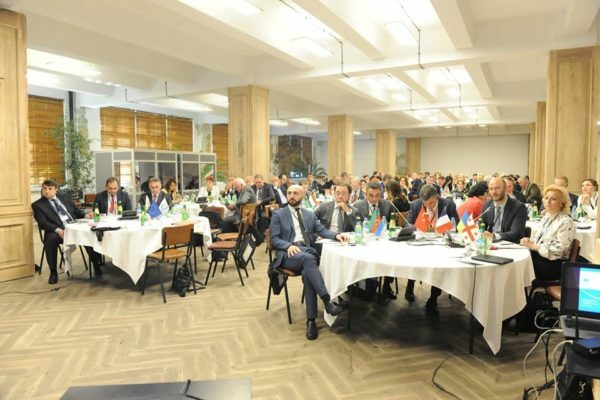 On October 26, 2018, AEA-EAL and World Trade Institute organized workshop “Market Access: Legal Parameters in Europe and beyond” devoted to various aspects of trade of third parties with the UE. Top experts, politicians and specialists discussed possibilities of market access and its regulations – from general WTO rules to association and possible membership. More detailed relation from the workshop will be available soon. 120 lawyers from 14 countries, 5 moderators and 33 speakers discussed in Almaty in June 15 – 16 how to improve the quality of legal services in Kazakhstan and in other countries of the Central Asia. Five conference sessions: INDEPENDENCE was chaired by Maria Ślązak, CONTINUING LEGAL EDUCATION chaired by Sergiey Sizintzev, PROFESSIONAL ETHICS chaired by Jędrzej Klatka, LEGAL AID, chaired by Jonathan Goldsmith, and DISCIPLINARY PROCEEDINGS chaired by Norville Conolly. Within topics discussed during the conference “Advocates 2018” we promoted the concept of the self-regulated profession, boosted networking between advocates from Central Asia, Europe and other continents as well as promoted mutual professional co-operation between legal practitioners from different regions and legal jurisdictions. The event allowed a wide participation of our colleagues from the diverse regions to create a real forum not only for exchanging opinions and views, but also for filling information deficits, debating different viewpoints and for informal talks. It was probably the most important for advocates from Central Asia – lively discussions took place both on during sessions as well as on coffee breaks and lunches. Based on these discussion, conference recommendations have been drafted and presented. AEA-EAL together with Moldavian Young Lawyers Association (MYLA) organized on May 4, 2018 a seminar for young lawyers on European convention on the profession of lawyer (context and need for adoption), view on ethics rules – independence, confidentiality and conflict of interest as well as issues related to management of the law firms. The event took place in Kishinev. PRACTICAL ASPECTS OF THE EU REGULATION 2016/790 CONCERNING THE PROTECTION OF PERSONAL DATA. HOW LAWYERS SHOULD BE PREPARED? Conference “Practical aspects of the EU regulation 2016/679 concerning the protection of personal data. How the lawyers should be prepared?” took place on September 7-9, 2017 in Olsztyn. The AEA-EAL was a co-organizer of this event with its four prestigious speakers from United Kingdom (Iain Mitchell QC), Hungary (Peter Homoki), China (Susan Ning) and Poland (Manana Topolewska). Dean of the Olsztyn Bar Association Katarzyna Skrodzka – Sadowska and AEA-EAL President Maria Ślązak welcomed participants underlying that presence of lawyers and other guests from seven countries shows a European dimension of the conference. 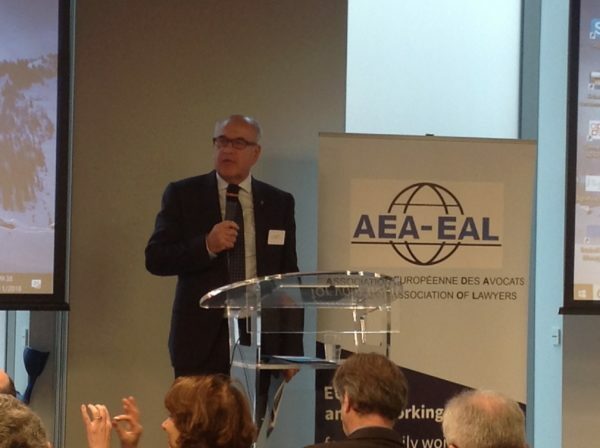 AEA-EAL President highlighted also importance General Data Protection Regulation (further GDPR), its practical aspects of implementation and preparation of lawyers and law firms for the new legal regime. AEA-EAL speakers presented relations of the coming law with the professional secrecy, guidelines of international organization of lawyers on implementation GDPR rules by lawyers and on how to advise clients on application of the Regulation, influence of the GDPR on business processes inside the company as well as on non- EU regulations in the area of data protection including transfer of data to another jurisdiction. The presentations also touched upon the best personal data protection practices under the GDPR, the tools for safe, effective and compliant with law transfer of personal data and practical examples of GDPR implementation challenges for lawyers. Participants also benefitted from the comprehensive cultural program, which allowed them to discover the beauty and hospitality of Warmia and Masuria Region. On June 15-16-17, took place at the Barcelona Bar Association the congress of the our Association, with a very important and successful conference on the new European Regulation about cross-border insolvencies, and the forthcoming Proposal for a Directive on preventive restructuring frameworks and Fresh Start opportunities. This new Regulation and the forthcoming Proposal for a Directive represent a major step forward in achieving uniform insolvency regulation at European level. This is to avoid obstacles in the management of processes, since more and more companies have branches, and workplaces spread throughout Europe. The conference in Barcelona brought together a dozen experts from different countries who debated before the participants about their respective systems and the opportunities and advantages of a more harmonized system. 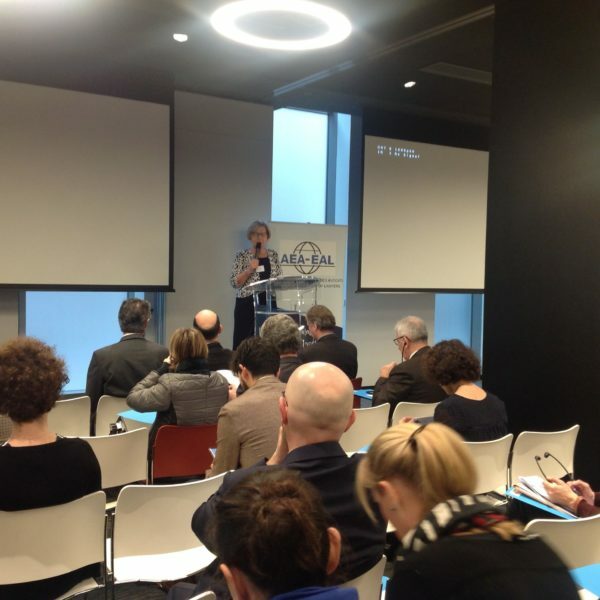 The conference was opened by the member of the Board of the Barcelona Bar, responsible for international affairs. But not all was work! There were different very kind events for the network and relaxing. “THE AUTOMATIC EXCHANGE OF INFORMATION ON TAX MATTERS: FROM OECD MODEL TO THE EUROPEAN FATCA AGREEMENT. 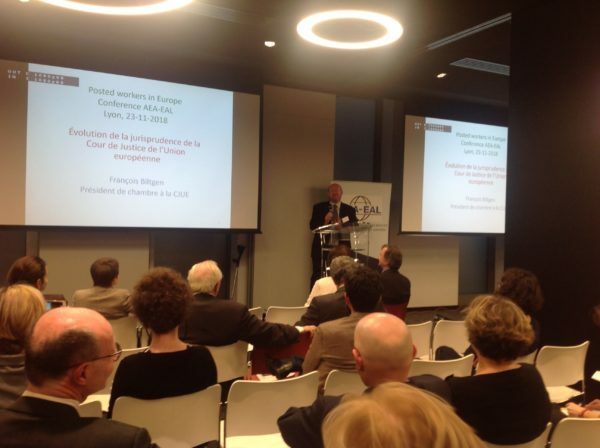 The EAL will hold its annual General Assembly on Saturday May 26th 2012 at 4.00 pm at the EAL’s working offices, Avenue Louise 385/1, 1050 Brussels. As members of the International Association AEA-EAL, you are most welcome to the Ordinary Annual General Meeting. Due to an agreement with the European Bars Federation and the Brussels Bar, the EAL members will be able to register to the EBF’s general congress to be hold in Brussels on May 24th, 25th and 26th 2012 and meet colleagues from all over Europe. On April 14th, 15th and 16th, the European Association of Lawyers invited its members and supporters to study and networking days in Poland. I would like to invite you on 22nd October in Paris to celebrate together the 30th Anniversary of the AEA-EAL. 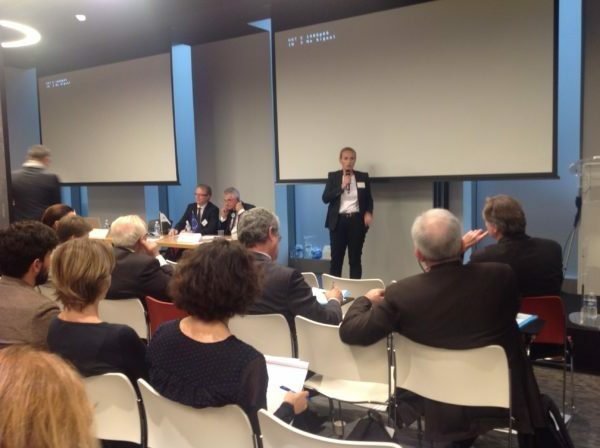 Our meeting will take place on the day after the conference organized by CCBE, also in Paris on Friday 21st October about “Innovation & future of the legal profession”. We will enjoy a gala evening at the prestigious place of the Cercle de l’Union Interalliée, 33 Rue du Faubourg Saint Honoré, F – 75008 PARIS. Please find full program and the registration form below. On May the 6th and 7th 2011, the European Association of Lawyers held a congress celebrating its 25th anniversary under the important but still largely ignored main topic of ‘Insolvency under European law’. The European Commission’s best specialists underlined the growing importance of European law and its impact on our own legal systems. 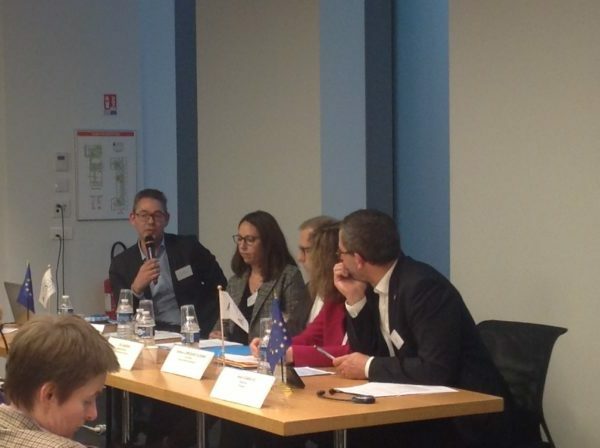 Well known specialists explained the complexity of the European Insolvency Regulation, the problems related and number of legal consequences to be aware of. Rome I is a complex but very important tool in the legal practice of lawyers advising in cross-border matters. Our next conference is dedicated to this subject. We are delighted to organise this event jointly with the district bar of legal advisors of Sszczecin in Poland. 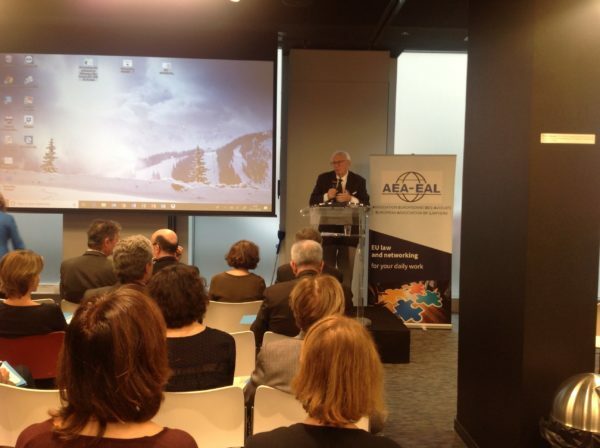 This inasmuch as one of the main goals of AEA-EAL is to intensify the contacts with our colleagues in Eastern countries. There were significant changes regarding the lawyers’ profession in the last few years. Further challenges and issues are awaiting: to what extent shall continuing training be required? How shall deontology be defined? How will the new technologies influence the lawyer’s activity? What shall be the right relationship with other legal, audit or commercial professions? etc. The modernization of the lawyers’ profession will be the topic of the morning session held jointly with the F.B.E. LAST 3RD OCTOBER, A SEMINAR IN BARCELONA WAS HELD ABOUT THE FIGHT AGAINST LATE PAYMENTS IN THE EUROPEAN CONTEXT AND THE NEW PROCEDURE OF EUROPEAN ORDER OF PAYMENT. On 12 December 2008, the new procedure of European Order of Payment, created by the regulation 1896/2006 will be applicable. 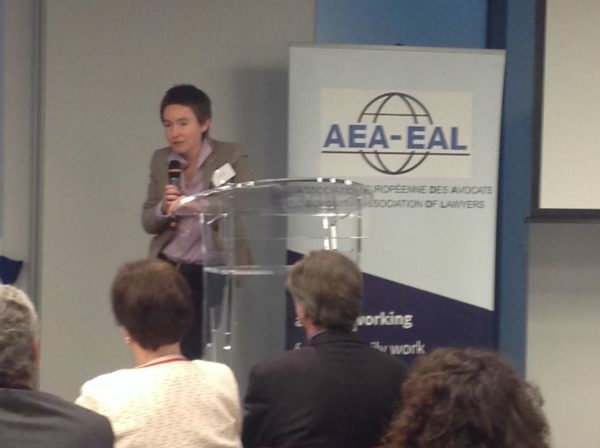 The AEA-EAL, following its spirit of approaching the latest in European Law to the lawyers of the Old Continent, and into the context of the Procedural Sessions to be hold regularly in Barcelona, wanted to use the opportunity to deeply analyse this new procedural tool, which will certainly have a prime place in the fight against trans-national late payments, especially in the present situation of economical crisis. To be able to provide the best lecturers, Professor in Procedural Law and Former Dean of the Barcelona Bar, Pr. Dr. Jaime Alonso-Cuevillas, organized the scientific programme. The European Commission, in 2003 and then in 2005, examined the question relative to the validity of the laws and professional rules that restricted the following aspects: the organisation and the ownership of structures offering judicial services, the possibilities of partnership with others professions, especially with chartered accountants and the opening of branch, franchises or chains. I am pleased to inform you about the seminar that will take place at the Barcelona Bar Association on Friday 3rd October 2008. The seminar is entitled fight against late payment in the European context. Last May, from 22nd to 24th, we held a very special and successful Congress at Istanbul. For the first time, we made a joint Congress with the Federation of European Bars (FBE), where we organized a working session about Procedural Issues between EU and third Countries. The FIDE is a federation of national associations of the Study of European Law which meet every two years to prepare a Congress, the next being in Linz (Austria) at the end of May (see: http://www.fide2008.org/). Our association will hold its next congress in Istanbul, which is an exceptional project. The idea and possibility of organising a joint event together with the Federation of Bar Associations of Europe, arose through the previous duties of the current President, Juan Nuñez, who was General Secretary of this institution during six years. The conference started on Thursday evening with a fine cheese fondue dinner in the cosy “Fromagerie” of the hotel Palace where almost all the speakers and some of the participants were present. 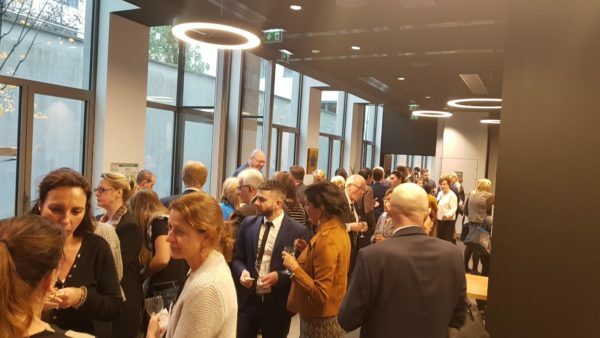 The conference was organised by The European Legal Forum (IPR Verlag) and the AEA – Associatión Européenne d’Avocats – in cooperation with the Suisse Institute of Comparative Law and the Dutch ASSER Instituut. It took place in the European University Institute in Florence on the 26th and 27th October 2007. I would like to register for this event and fill in the subscription form for the conference and send it by fax to the indicated location. REGISTER NOW.